The 2112 can open long runs of mixed-size envelopes at up to 24,000 pieces per hour. Instead of struggling to keep pace with medium-to-high volumes of incoming mail, you’ll relax as the 2112 gives you a long life of reliable, efficient operation. This robust envelope opener uses a powerful milling cutter that creates precise feathered cut edges, eliminating the risk of painful paper cuts when removing envelope contents. The milling technology creates fine, dense paper chips that collect in a large waste bin, allowing for long uninterrupted runs. Milling Cutter Technology: The 2112’s milling cutter creates soft finger-friendly edges, sending the cuttings cleanly into a large waste bin. Large Envelope Capacity: The machine can handle envelope lengths up to 13.5″ and nearly ¼” thick, including most cardboard “overnight delivery” envelopes like USPS Priority Mail Flat Rate. 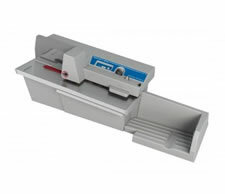 Input and Output: The feeding mechanism adjusts automatically to mixed sizes of mail, and the adjustable output tray can accommodate large envelopes, flats, and overnight envelopes. Automatic Counter & Display: Use the easy-viewing counter to track and record how many envelopes you process. The display also features a “Catch Tray Full” indicator, signaling you to empty the waste bin. Cut Depth Setting: The 2112 has two cut-depth settings for normal and thicker mail, as well as a “no-cut” setting to simply count envelopes. AMSS is a third generation family business that started in 1941 by Warren S. Johnson. AMSS specializes in postage meters and mailroom products, with local Service and support covering Northern Ohio. Automation Mailing & Shipping Solutions Inc.